If you're my friend on Facebook, then you know I post a lot (a lot!) of pictures of my girls - but come on, they are pretty cute! Mommy, Can I Lick the Spoon? won't be any different...you've been warned! As the girls get older, one of the things I've been most excited about is baking with them. 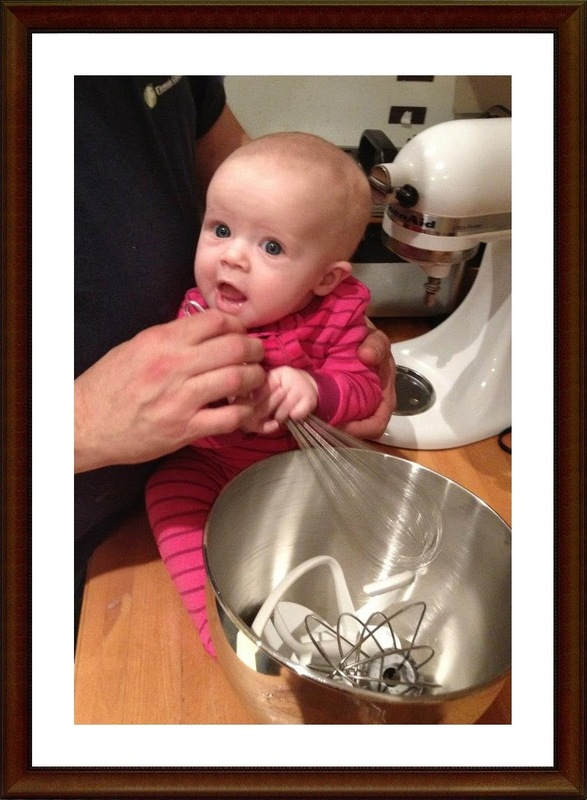 When Lauren was born (and we had somewhat settled into having a newborn - if that's even possible), I wondered how old she had to be before we could bake together. When she turned two, we bought her an apron for her birthday. I figured if she had an apron, she'd maybe want to be involved...not so much. We loved her apron, she hated it. It turns out that for Lauren, around 2.5 was the magic age for her to want to help in the kitchen. And by help, I mean bake with me, not empty the cupboards, grab stuff from drawers, climb on chairs and tables etc...like Olivia does. Speaking of Olivia, she's so badly wanted to be a part of it all since she was around 13 months. She actually takes Lauren's apron and says "on" and then tries to push their big stool (in the picture below) into the kitchen. Lauren loves her apron now and says it's real cool and has to be wearing it before we start. So now that Lauren likes baking and Olivia is at an age where she can do more, I always have company in the kitchen. Having them in the kitchen with me is actually a good thing, because if they're with me, they can't be causing trouble elsewhere! With my little helpers in mind, my Kids in the Kitchen series was born. Being 18 months apart means the little ladies are obviously at different stages, so I'm always thinking about what age appropriate kitchen tasks and activities will keep both of them learning, entertained, excited and (let's be honest), out of my hair while we're baking or cooking. So what exactly can a couple of rambunctious toddlers do in the kitchen? Actually a lot. If you ask Dave about my baking or cooking process he'll without a doubt say that I'm messy, and use way too many dishes, which I suppose is true...But baking with the girls takes it to a whole new level. Having two little girls, I've always said that everything takes twice as long to do, there's twice the mess, but there's also twice the love and fun. And baking with them is no different. Check back on Sunday for my first Kids in the Kitchen post! How is Molly almost 5 already??!! It's crazy how fast they change. Just a few months ago, Lauren's attention span was so short and she'd be ready to go play half way through baking. Now she's there until the end! Such a great blog. Love the pictures, bring em on!